At nineteen years old, you’d have to agree that Miss Sissi has certainly kept-up her figure admirably. Pretty and petite, and with design traits both contemporary and traditional, she is destined to be popular wherever she goes. You know anything with “Sissi” in the name has to be good. Like so many of the other lamps that caught my eye, this one did so with color. 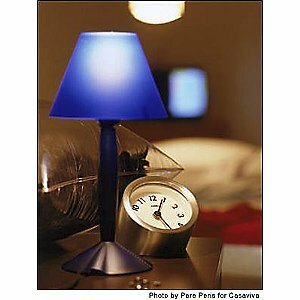 This is a classic 1991 design by Philippe Starck for Flos. Like the Kartell Take Table Lamp (from Day 1), Miss Sissi is small and vibrantly monochromatic (white, blue or green) and made out of injection-molded polycarbonate to realistically mimic the shape of a traditional table lamp. Where Miss Sissi differs, though, is in her frosty, somewhat opaque lighting effect. She also maintains a more slender form, balanced by a weighted bottom that keeps her from accidentally tipping over.